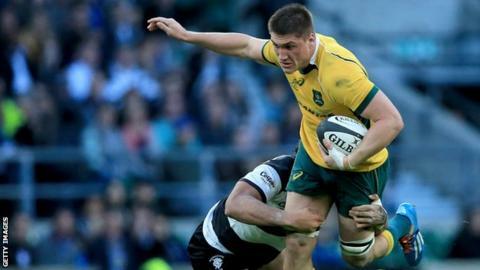 Melbourne Rebels flanker Sean McMahon will make his senior Australia debut against Wales in Cardiff on Saturday. The 20-year-old replaces injured Scott Fardy and is one of two changes to the side that lost 29-28 to New Zealand in October. Number eight Ben McCalman takes over from Scott Higginbotham, who is also sidelined through injury. Will Genia is among the replacements but there is no place in the matchday squad for the Quade Cooper. McMahon featured in the Baa-baas game and has been rewarded for a strong performance with a starting place against Wales. "Sean made the most of his opportunity and brought great work-rate and physicality to our game," said coach Michael Cheika, who takes charge of his first Test after replacing Ewen McKenzie. "Going into the Barbarians match, it was made clear that players had an opportunity to push their way into the Test team with a strong performance. "Everyone has worked really hard on preparing themselves in the best possible way, and we're all excited about the opportunity to represent Australia and give our absolute best on Saturday." Uncapped Western Force prop Tetera Faulkner is among the replacements named, one of which will be left out of the matchday squad before Saturday. Australia: I Folau; A Ashley-Cooper, T Kuridrani, C Leali'ifano, J Tomane; B Foley, N Phipps; J Slipper, S Fainga'a, S Kepu, S Carter, R Simmons, S McMahon, M Hooper (capt), B McCalman. Replacements (from): J Hanson, T Faulkner, B Alexander, J Horwill, W Skelton, M Hodgson, W Genia, R Horne.